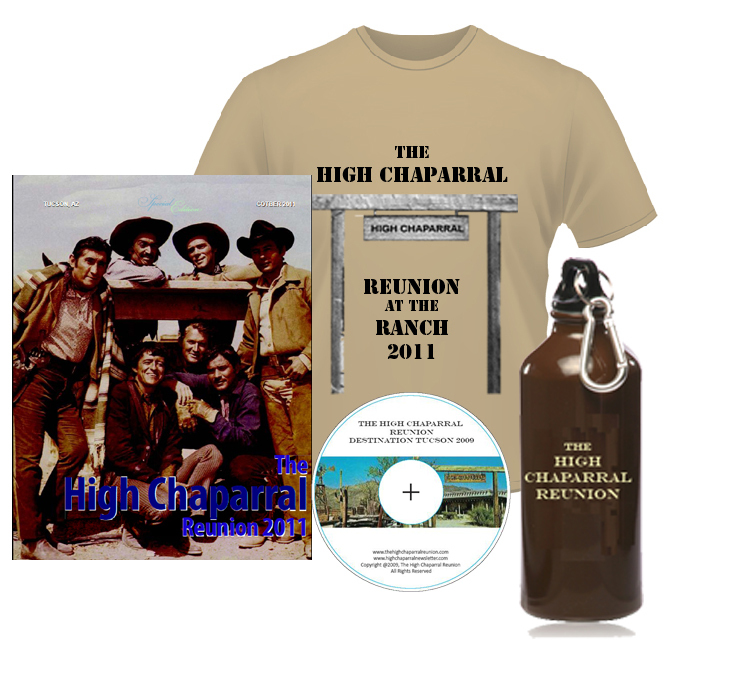 Whew - it's time to start making decisions for the NEXT High Chaparral Reunion! One of the most critical choices to make is the date, and we need YOUR input. Please take this extremely brief survey to let us know your thoughts about date and location. The High Chaparral episode “Stinky Flanagan” was a rare occurrence in the four years of the show’s run - its one I didn’t really care for. I have tried to like it, for its writer’s sake. Henry Wills was an outstanding stuntman and stunt coordinator and an all-round wonderful man according to everyone who worked with him. “Stinky Flanagan” is his one and only writing credit. And the writing is good. 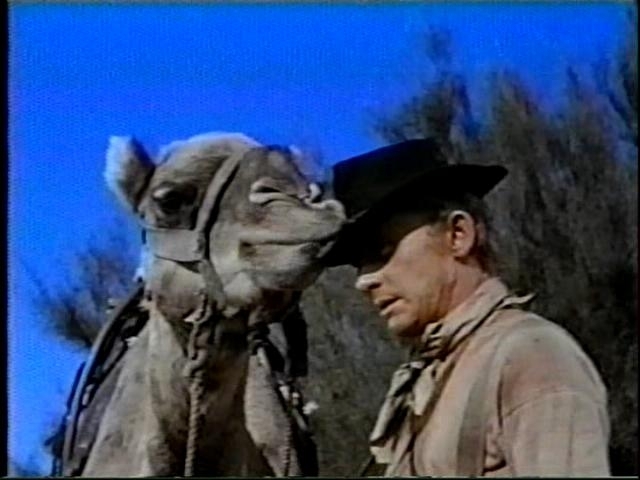 The episode is face-paced (well, except for Frank Gorshin’s singing scene), the dialogue witty, there are some great horse stunt scenes when various cowboys are clinging to mounts spooked by the camel. But a camel? In the Arizona desert? Part of the US Calvary (unwanted though she may be)? Come on, I know the show is fiction but it just is too much of a stretch. Except that...it isn’t. I’ve recently found out that there were actually camels in the Arizona desert! It all began with Jefferson Davis. Before he became the leader of the Confederacy during the civil war, Davis was Secretary of War under President Franklin Pierce. It was his extensive research that brought the camel matter into senate committee meetings. It was thought that camels could travel faster than horses as well as go without water for longer periods. Apparently it took 120 days to get from the capitol to California on horseback, so a faster animal would be a boon. After several years of requests for Congress to approve the funding (some things never change), a bill was passed in 1855 that would allow the purchase of camels for transportation purposes in the frontier. 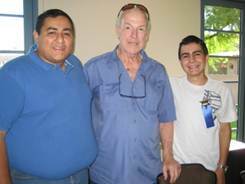 A year later the first bunch arrived in Texas after an arduous journey from Egypt. Their new home was a military post called Camp Verde, not far from San Antonio. When the U.S. Army sent the first survey crews to northern Arizona in 1857 to it included a herd of approximately 30 camels. They proved to be able to carry twice as much as horses, travel the same distance in half the time and climb mountain passes that horses could not. The horses were of the opinion that the camels smelled bad and objected to be stabled near them. Mules simply panicked at their sight. But Jefferson Davis thought his camel experiment was a success. Unfortunately, when the Civil War began in 1861, neither side wanted to take care of camels and the experiment was over. One of the camel drivers was a Syrian named Hadji Ali, brought over to teach the soldiers how to use the animals (after all, the camels couldn’t understand English). His name was unpronounceable in the US, and he was nicknamed Hi Jolly. When the camels were discharged from their military duty, Hi Jolly began a business hauling freight from Yuma, Arizona to Tucson with some of the remaining beasts of burden. The business failed eventually and Hi Jolly released the animals into the desert near Gila Bend (that’s about 125 miles from Tucson). He married a Tucson woman in 1852 and later settled in Quartzsite, Arizona. 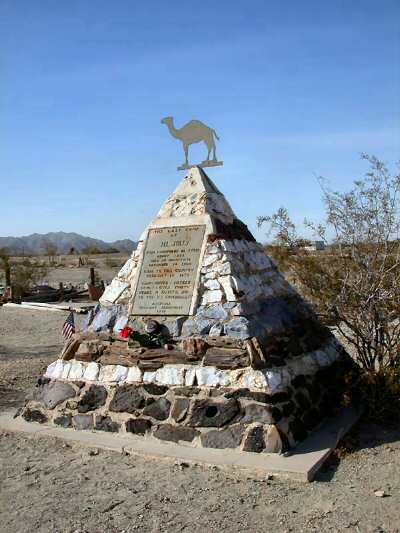 In 1935, the governor of Arizona dedicated a monument to Hi Jolly and the Camel Corps in the Quartzsite Cemetery. For years after the camels were released, they were spotted roaming wild in the Arizona desert. The last reported sighting of a camel in Arizona varies from source to source. Some say 1942, some say 1946! One was seen in Baja, California in 1956. There is a popular legend about a camel named Red Ghost who carries a headless rider...but that’s another story for another issue. So, Tilly, I’m sorry that I scoffed at you. You came from a proud heritage and rightly deserved to be part of The High Chaparral. 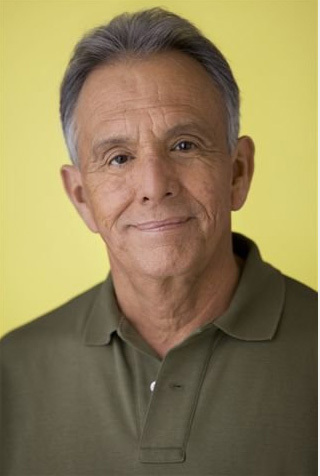 Rudy Ramos has new photos on IMDB. Fans of Wind will see he still looks very handsome! 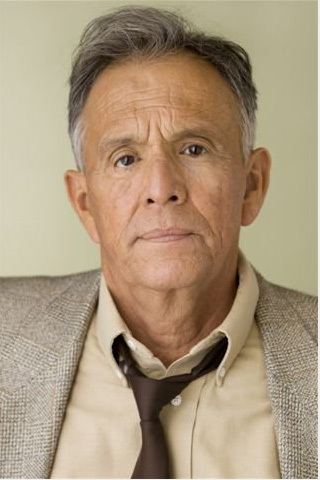 Check out the rest on Rudy's IMDB listing. Just wanted to recap some of the exciting times that I enjoyed during my Tucson adventure. It all started with my travel day (Weds Oct. 19th) when I was scheduled to speak at a new Prison Writing program in a medium security prison in Adelanto, CA. The program was delayed that day so I had some time on my hands. Knowing that I had some extra vacation cash on hand, I just couldn’t resist stopping by my favorite antique place--- “Antique Station” in Oro Grande, CA. It’s one of the oldest places along the Mojave River with a train siding and stands of cottonwood trees. I’m always in search of rustic items for my children’s traveling museum… but that’s a whole other story. So among the commissioned displays of antiques and collectibles, I found a large gold pan for my mining equipment section … tick that one off my list. And that lucky pan got to travel with me to Tucson. I planned to meet Vickie Harvey in Rancho Bernardo north of San Diego, stay overnight with her and her parents, and get an early start in the morning heading for Tucson. Traffic was light and I was there in no time. Vickie’s family name comes from the historic Harvey House line of descendents who catered to the railroad travelers at each station. They still open their home for guests and treat me like royalty. Thank you, Bill and June. No fog the morning we left. Vickie is a great navigator so we zipped through to Tucson in excellent time, arriving at Lodge on the Desert by 3 pm. We checked in and then I put my Posse transportation hat on to help get our first trip out to Old Tucson for NightFall ready. 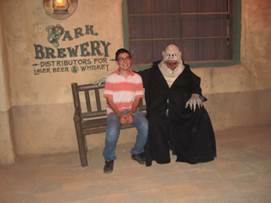 Three vans of revelers took off about 5:30 pm for a “spook-tacular” night tromping through horror shows, old ghost town alleys, and several theme-styled haunted houses. I didn’t go this time so you’ll have to ask Vickie or others who went that night. I did hear that the chainsaw ghoul was wandering the streets. However, the first time in 1999, I went with my husband Jeff, we were really spooked. Good fun even for the adults. The best part was finding that an exit from one of the haunted adventures came right through The High Chaparral ranch house!!. I knew it because I looked up to see the huge timbers over the doorway and the huge covered porch entry way. I didn’t want to leave. But someone kept forcing me to exit, dang. It so happened that many hotels were filled to capacity due to the college game where Arizona played UCLA at Tucson. I was in the bar to grab a bite to eat when the sports TV screens were blaring the news that Arizona was 41 to 7 and still had a quarter of the game to go. I’m not a sports fan but I couldn’t help but get excited watching another touchdown. The place was unhinged. Penny McQueen had selected the Lodge for its open floor plans, beautiful southwestern décor, history, ease of walking between our venues, large banquet rooms, and, let’s face it, landscaping to die for. I love fragrant lantana, and it was everywhere. Even at night, the scents of the desert flowers rose from the walkways like stepping on rosebuds down a wedding aisle. Very intense. My bed was a king-size and nearly three feet off the floor to get on the mattress. Had a wonderful and comfortable night’s sleep, too. I was sharing a room with Deborah Dyess but she hadn’t arrived yet. 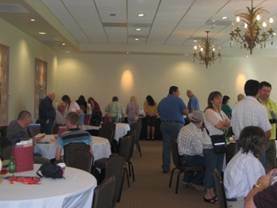 One of the first days we get to reunite with members is during the Registration and Welcome. Everyone wanders through the doors and gets their bearings. It isn’t long before they are gabbing with new and old friends. The Posse…Penny’s helpers… stood ready and handed out gift bags, name tags, programs, and extra gift bags donated by Carol Anne Gordon, one of our founding HCDG members. Carol Anne is living in Hawaii now but before she left the mainland, she asked if I would offer her extensive collection of HC materials to the participating fans. She had nearly 140 pounds of sentimental copies from magazines, photo collections, and a gazillion script copies to part with, as well as original materials and magazines. She even had a Master Binder full of real goodies. I felt it was my honor to make sure as many fans as possible could have what Carol Anne had coveted for so long. At one time, she rivaled the Smithsonian Institute… hehehe. 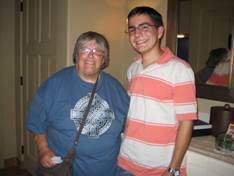 And I must also thank Vickie for helping me separate all that memorabilia during the summer into those gift bags. Thirty freebie bags were handed out. Thank you, Carol Anne. Registration Day is also set aside for reconnecting with the HC stars, taking casual photos, and catching up on the news. This year we had a larger contingent of Spanish-speaking fans from Mexico, and Central and South America. Nieves Fernandez, who also returned, was a terrific translator on more than one occasion during our weekend. It’s also the time to test your camera and double check to see if your batteries are working. The cameras clicked like castañets. (Check out the photo albums online) Some participants were arriving late due to flight foul-ups and lost luggage, but by noon, everyone had made their entrance. Before the evening event started, something was up. I could hear mariachi music in the courtyard. Real strumming and horn-playing Mexican musicians strolled on the lawn and it was all for us. Susan McCray had surprised us with a treat for sure. The mariachis even played a rendition of The High Chaparral Theme song, mariachi-style. I do hope someone recorded it. As Penny always reminds us, much of our activities throughout the weekend are sponsored by many others who offer extra money to help finance these events, and by those who have never been able to attend the events. It’s all due to their generosity that many of us enjoy the camaraderie of so many. The Sponsors Dinner was well attended. We talked, we laughed, we watched an episode, “Mark of the Turtle” in the background. And applauded when Don Collier said his lines. Too funny. Oh, the food. Half the fun of going is enjoying the wonderful food offered by one of the top chefs in Tucson. All dishes were tasty, and held enough Mexican/American flair to be appreciated by all. In addition, the staff more than made up for any inconsistencies. They always arrived to help and take care of any detail. A very friendly staff. By nine am Saturday morning, four vans pulled away from the Lodge heading for a day in Old Tucson. 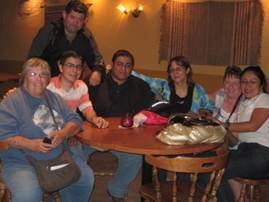 I know many of our local guests arrived just for the autograph signing and luncheon that day, but the fans from the Lodge knew that the whole town had open doors. I saw fans taking pictures of every building in town, even the newer ones under construction. Yes, Old Tucson Studios is enjoying a regeneration of its own with a string of new buildings right on the main street. 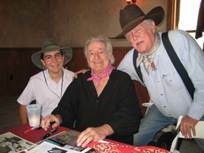 Just like last reunion, the autograph signing, held inside the High Chaparral ranch building , offered air conditioning, and celebs seated at their tables with photos to sign. 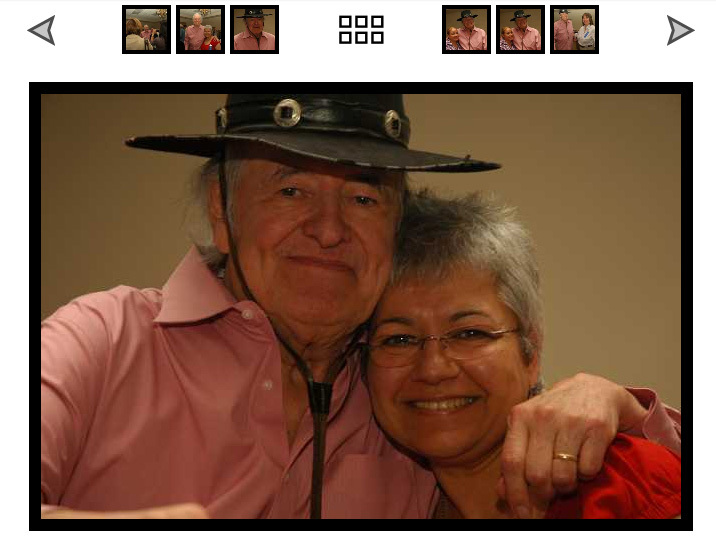 Relatives of Don Collier and old friends of the High Chaparral cast and crew stopped by to talk and reminisce. 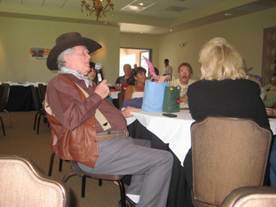 I caught a photo of Henry Darrow showing off his famous sombrero -- the “original hat of ten”, as he calls it. Since in wardrobe, there was never just one of anything. Always had back-up costumes. You’ll see a photo of Rudy Ramos in an intense conversation with another fan. There was handshaking going on all morning. Since our Reunion 2011 had its own memorabilia for the public to purchase, I was asked to help man a table. I got to talk with fans who had heard about the event and drove out to see it, others had made earlier plans to attend, and yet other families just happened by and got caught up in the story telling. Bob Shelton, the long-time owner of Old Tucson studios is great at getting people together. He was always on standby along with Producer Kent McCray and his wife, and casting director, Susan McCray. Luncheon plans had grown from last reunion so we walked across the yard to Stage 2, a new sound stage and utility barn for hosting large crowds. We had definitely grown since last time in 2009. A large stage platform was set at one end for the celebrity discussion panel afterward, a drinks bar sat at the other end, and our banquet tables sat in the center with plenty of elbowroom. The buffet entrees filled the building with rich aromas, and then the mariachi band arrived, playing great Mexican tunes and once again the favorite: High Chaparral theme. I sat with Ronnie Rubino and Anthony, his buddy from Yuma AZ. 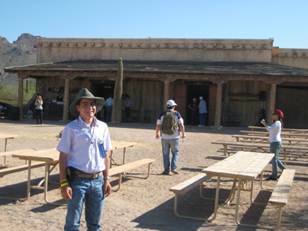 Ronnie is the designer and owner of his duplication of High Chaparral ranch in Yuma. 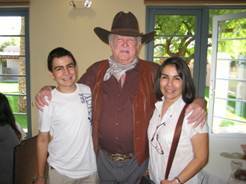 If you haven’t heard or seen it, I believe his home is on the www.thehighchaparral.com site. He spent months gathering the original plans from David Dortort and his designers to fabricate the home he lives in from those plans. The set décor and details on how the home would suit a conversion to have size-appropriate bedrooms, was the major struggle. Remember the original High Chaparral set was only a false-front mock-up where the autograph session was held. Later, we walked through Old Tucson and took in a shoot-out on the street, and did some window shopping. Most of the shops had closed early preparing for another night of NightFall. By four pm, we all gathered back into the vans heading for the Lodge, stomachs well satisfied, and memories reeling in our brains. Oh, I forgot to mention that one van would be held for a delayed exit because about 10 fans had prearranged to go horseback riding on the back lot at the end of the day. The day was warm but not as hot as last year, so although the “cowboys’ were tired and steamy, none of them complained. The grins plastered to their faces was documentation enough. Back at the Lodge, fans were on their own to clean up, take naps, watch episodes of HC or go touring around the Tucson nightlife. But, the idea was to keep you busy and well-fed. So, sure as the moon glints across the Saltillo tiles of the main lobby, we were back at the Palm Room enjoying our dinner meal with excellent chicken ala picata, and tasty vegetables. Kiva Hoy was presented a memorial certificate from the National Museum of Marine Corp in West Virginia, on behalf of Bobby Hoy’s service to the military, as well as a paver stone placed in his honor on the path leading to the museum. We’ll have to thank the McCrays for making that happen. I don’t think there was a dry eye in the room. We miss you Bobby. We took our cameras and stopped by the visitor’s shop first. Although the canyon is open to bikes and foot traffic, all bikes are required to leave the trails by 9 am so the shuttle trams can run all day. The ride takes a winding paved route nearly four miles into the upper canyon where many movie locations were filmed. The tram drivers give highlights of the canyon’s history by microphone. There are designated stops along the way for photo shoots and to pick up hikers along the trail. It’s suitable for short-term hikers, family picnics, and bird watching. We’d also like to consider this feature as an addition to events on Reunion schedule for next time. We timed the ride and shopping in the gift shop, as well as taking a short hike along the trail. We believe we can transport to the parking lot and back to the Lodge within 3 hours. We can also adjust the Tucson Sunday tour to start later in the day. Let us know what you think of that. Since so many of us enjoy shopping in Tucson, the Sunday Tour was reduced to two stops: the San Xavier del Bac Mission and downtown Presidio at Old Tucson Artisans building. We met Brent Martin, our tour guide, onboard the executive shuttle at the Lodge curbside pickup. As we began our tour, we realized so many of our travelers spoke only Spanish. They were rather bored but Gabriela asked if we could translate. Up stepped Brent and Nieves to help with the translations, so all the travelers could enjoy the sights. We traveled on to downtown Tucson and our driver selected historic blocks where we could see and compare the early architectural periods of Tucson’s housing. From adobe flat roof bungalows to modified conical and gabled roof styles, Tucson holds so much history it would take weeks to tour it all. To wrap up the amazing activities of the weekend, we settled back at the Lodge in the Palm Room to enjoy some cowboy songs and up-beat swing from the talents of “Way Out West.” Tom Poley and his wife Emmie join Slim, who isn’t, and share some of the old cowboy campfire songs, as well as their new tunes. Tom played the guitar and banjo, Emmie strummed the guitar and mandolin, while Slim thumped on the big bass. All three can blend their voices very well, creating a unique trio sound. Even our hostess, Penny McQueen, stepped up to share a story about how Bob Hoy would often get bored waiting in lines while on tour, and just begin singing. Penny was witness to this when Bobby sang She Wore a Yellow Ribbon to the raunchy words he had substituted. Penny didn’t sing that rendition but she did croon the traditional song accompanied by Tom for the enjoyment of us all. I still had one more thing to take care of. Remember I had that huge master folder from Carol Anne? Well, I had been figuring that a true blue fan of HC would be the die-hard revelers at the songfest. So it came down to Janet and her sister Liz or Nieves and her sister Adela. And as it turned out when we all got together, Nieves is an archivist for a museum in Ireland and her sister can digitize the whole collection so all of our fans can share the originals on CD format. How cool is that. I had found the perfect home for the grande collection after all. Now never let it be said that Tucson isn’t the primo spot for everything southwest. But there is an historic location north of the city that is known for being the farthest West battlefield site of the Civil War. 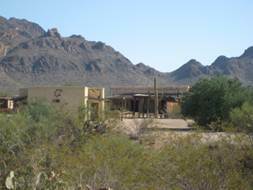 A skirmish was fought at Picacho Peak and now a camping, hiking, and RV spot capitalizes on this history. Vickie and I headed out there early Monday morning and stopped to take a few photos, enjoy the cool morning air, and read the plaques commemorating the site. And she was right. We hauled out whatever we could carry. And as we rode into the west, sadly, we were missing the silhouette of a saguaro strapped to the top of my Jeep. After I saw almost all the episodes, I thought about what a wonderful experience could be to meet some of the actors, remember I said to myself... "No Carlos, you aren’t crazy, that’s so difficult". But I also knew it could happen, because I had been reading the High Chaparral web page a few days ago and I read all the info about the reunions. I was still saying it wouldn't come true. After some weeks I met Rudy Ramos thru an email, I wrote to him on his web page, I was like in shock (really surprised), then he wrote me back, when I got these email I was jumping like a kid, like I was! It was so amazing, then I met Ginny Shook she is a Rudy's good friend, I remembered she told me something like, "Hi Carlos, I'm sorry I write you back a little late, every day Rudy ask me if I already sent the email to you...." Some weeks or days later (I don’t remember) I met Penny McQueen, because she was and still is like the manager of all the reunions, so she knew everything about the next reunion (2009); it was all the first part, everything was thru internet, I never thought they were kidding me, never. 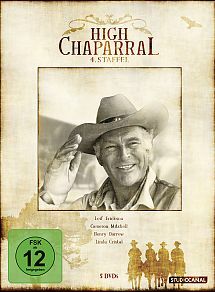 I kept reading about the High Chaparral on internet and different web pages but I had a big problem, I didn't speak english, just a little bit so Penny suggested me to write an email to Plinio (from Chile) he knew many things about the High Chaparral and he speaks Spanish so it was incredible!!! Since January 2009 I was looking for the American Visa, that's something hard to get… We had the date in September but we didn’t know that we will have the American Visa for the reunion, thanks God we got it for ten years!! Sadly I was still in the High School and we couldn't be in the reunion in 2009. When these reunion started I was at home, days before it I had sent many good wishes to all the fans, I know my spirit was there, the reunion in 2009 was a week before than the last one. In November after the reunion Plinio and others fans/friends sent to me some pictures, it was incredible because they didn’t send to me just the pictures, they wrote to me something like a letter explaining all those pictures, for some minutes I felt I had been there (My English was improving), after that I knew I should wait FOUR YEARS for the next reunion, those four years were the shortest!!! I used and I still use to write to some friends who I met them because the High Chaparral, I won’t write their names because I’m sure I’m going to miss one. Since January I had been talking with some of those friends, it was great and bad at the same time because some friends were in the reunion and some couldn’t go. In September I was counting the days and so nervous because my English, I have been studying English since I was six but to speak English here is so different than to speak English in US or in a country where people speak English. In October I used to had dreams with the High Chaparral and when I woke up, I said something like “Hey where am I? I’m at home, oh so it was a dream LOL!”. Finally we arrived in Tucson at 3:30pm (Tucson Time) we talked with a taxi driver lucky he spoke Spanish… Arriving to the Hotel I had a huge pain in my stomach, when we arrived the lady who was in the reception didn’t speak Spanish, my mom doesn’t speak English so I should to speak English.. Well the pain was ok, when we were almost opening the room’s door I heard two times… “Hi Carlos!” When I look besides me I SAW BRENDA AND GINGER!!! It was so amazing! I didn’t know what I could say LOL. Something like an hour after we should to go to the Nightfall, we had much fun there! 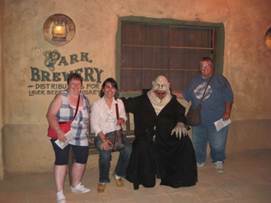 My mom and Brenda were who had much fun than us, they were so scared, everybody were but I think my mom and Brenda were the winners of SCARED PEOPLE. 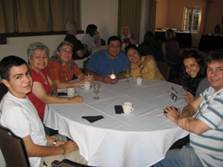 Then we ate together, while we were eating Plinio, Luisa (Plinio’s wife), Luis and Karla (Luis’wife) arrived!!! 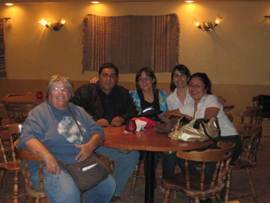 It was so amazing too, we were all together eating in the same table it was like Thanksgiving day… After we ate we were walking around Old Tucson Studios and we went again to the Hotel for rest. On Friday we woke up early in the morning for breakfast (all the breakfast were great!) and for the first meeting, Penny talked about John Cannon, she said that John’s dream was to do a reunion with many people from different countries that speak different languages, different opinions, at least LIKE THE HIGH CHAPARRAL REUNION! There we met Don Collier, Kent McCray and many fans, if my mind doesn’t make me jokes, Rudy and Henry couldn’t be there (but they were in the sponsors’ dinner, Friday night). 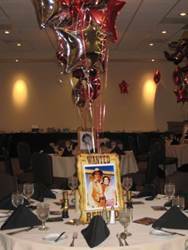 For the sponsors’ dinner the room was decorated with many things about High Chaparral and cowboys, pictures on the tables and many good things. On Saturday we woke up at 7am for breakfast I was so excited because Old Tucson Studios, we were with a lady who was talking about the houses and different films which were filmed there. After five or eight minutes walking the lady said, now turn left and these house you see over there is THE HIGH CHAPARRAL, THE RANCH HOUSE!!! We were taking photos all the day, we lunch in a beautiful and cold building. On Sunday SADLY THE LAST DAY like Friday and Saturday we woke up early for breakfast and we went to the signature time, we took many photos there, because the time I couldn’t say goodbye to many new friends. All those days the weather was excellent, in the afternoons hot, at night and mornings cold… I liked so much Tucson! I hope to be there for the reunion in 2013, thank you for made our first time in US WONDERFUL!!! And Penny, Crystal, Rusty, Ginny, Susan. Vickey, ladies like you there are a few in the whole world! THANK YOU! If I missed something, excuse me, if you want to watch all the photos which I took I shared it on my facebook wall. Like I use to say to all my friends “KEEP IN TOUCH” . Luego de ver casi todos los episodios, pensé en que maravillosa experiencia seria conocer a alguno de los actores, recuerdo que me dije… “No Carlos, no eres loco, eso es muy difícil”. Pero al mismo tiempo sabia que eso podría suceder, porque había leído la página web de el Gran Chaparral y había leído sobre las reuniones, sin embargo seguía pensando que eso no podría volverse realidad. Luego de unas semanas conocí a Rudy Ramos por email, le escribí a través de su página web, estaba en shock porque había conseguido la pagina de Viento, días después él me respondió a mi correo, cuando revise quienes me habían escrito y vi el nombre de Rudy, woww… Estaba saltando como un niño, fue increíble! Después conocí a Ginny Shook, ella es una buena amiga de Rudy, recuerdo que ella me dijo que estaba apenada porque no me había podido escribir antes, Rudy le preguntaba todos los días si me había respondido; semanas o días después (no recuerdo muy bien) conocí a Penny McQueen, porque ella era y sigue siendo la organizadora de las reuniones, sabía todo sobre la siguiente reunión (2009), ese fue el primer paso, todo absolutamente todo fue atreves del internet, jamás pensé que ellos me estaban bromeando o que era algo falso, jamás. Continué leyendo sobre el Gran Chaparral en internet y diferentes páginas web pero tenía un gran problema, no hablaba inglés, solo un poco entonces Penny me sugirió que le escribiera a Plinio (de Chile) el sabia muchas cosas sobre el Gran Chaparral y habla español, por tanto era maravilloso!!! Desde enero de 2009 estuve pendiente y haciendo las respectivas diligencias (con mi mamá) para obtener la visa americana, eso es un poco difícil de obtener… Nuestra cita fue en septiembre pero no sabíamos que la tendríamos para la reunión, gracias a Dios nos aprobaron la visa por diez años! Lamentablemente aún estaba en la secundaria y no pudimos ir a la reunión en el 2009. Cuando se realizó la reunión en 2009 nueve yo estaba en casa, días antes envíe muchos buenos deseos para todos los fans, sé que mi espíritu estuvo allí, dicha reunión se realizó una semana antes que la de este año. En Noviembre luego de la reunión Plinio y otros amigos fans me enviaron algunas fotos, fue muy divertido porque ellos no me enviaron solo las fotos, ellos me explicaron cada foto, por unos minutos me sentí como si hubiese estado allí (Mi inglés estaba mejorando), luego de eso debí esperar CUATRO AÑOS para la siguiente reunión, esos cuatro años fueron los más cortos!! Solía y suelo escribirles a varios amigos que los conocí gracias al Chaparral, no los nombraré porque estoy seguro que se me olvidará alguno. Desde enero había estado hablando con esos amigos, fue fino y a la vez no porque algunos amigos estuvieron en la reunión y otros no. En Septiembre estaba contando los días y estaba un poco nervioso por mi inglés, he estudiado inglés desde que tenía seis años de edad pero hablar inglés con latinos es muy diferente que hablar inglés con americanos o personas que su idioma natal es el inglés. En Octubre solía soñar con el Chaparral y cuando despertaba decía “Hey dónde estoy? Estoy en casa, entonces eso fue un sueño!!!”. Luego comimos juntos, mientras estábamos comiendo llegaron Plinio (De Chile), Luisa (La esposa de Plinio), Luis (De Guatemala) y Karla (La esposa de Luis)!! Fue demasiado bacán, estuvimos todos comiendo en la misma mesa como el Día de Acción de Gracias… Luego de comer estuvimos caminando por los alrededores de Old Tucson Studios, por último nos regresamos al hotel para descansar. El viernes nos levantamos temprano para desayunar y luego irnos a la primera reunión de los fans con los actores, Penny habló sobre John Cannon, ella comentó el sueño de Cannon fue reunir personas, de diferentes países, que hablaran diferentes idiomas, diferentes puntos de vistas, en fin COMO LA REUNION DE EL GRAN CHAPARRAL!! En el mismo salón conocimos a Don Collier, Kent McCray y muchos fans, si mi mente no me engaña, Rudy y Henry no pudieron estar allí (pero estuvieron en la cena Sponsors’, en la noche). Para la cena Sponsors’(Cena de Patrocinadores) el salón estaba decorado con cosas alusivas al Chaparral y vaqueros, fotos sobre las mesas de la serie y muchas otras cosas. El sábado nos levantamos a las 7am para desayunar e irnos para Old Tucson Studios, estaba muy emocionado porque ese día íbamos a conocer el RANCHO CANNON! 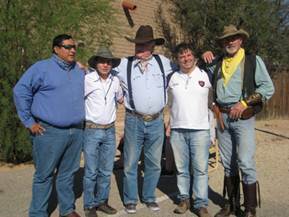 Estábamos con una guía de Old Tucson quien nos indicaba por donde estábamos pasando, luego de cinco u ocho minutos caminando la guía dijo… Ahora giren hacia la izquierda y esa casa que ustedes ven allá es LA CASA DEL RANCHO CANNON!! Fue fantástico! Estuvimos tomando fotos todo el día, almorzamos en una sala muy bonita dentro de Old Tucson, estaba my fresco ahí dentro. El domingo LAMENTABLEMENTE ERA EL ULTIMO DIA como el viernes y el sábado nos levantamos temprano para desayunar e irnos para la sesión de fotos y autógrafos, tomamos muchas fotos, por cuestión de tiempo no me pude despedir de muchos amigos. 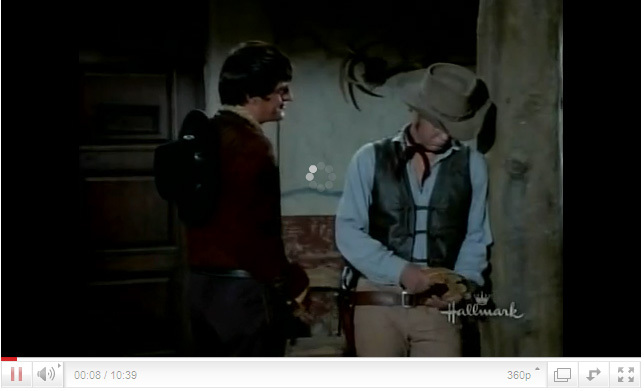 Back in Nov 2010, we looked at continuity errors in High Chaparral and since I’ve been spotting them in other shows of late, I thought we’d go back to look at a few I didn’t mention. I love finding them! They make me smile because I can’t help thinking of something like a scene from Bewitched where things vanish and reappear or hair suddenly tidies itself in the middle of a fight only to mess itself up again later. You can almost picture old Aunt Clara muddling up her spells – only it’s happening on High Chaparral. I wonder what a confused Chaparral witch might be named and what mishaps she might cause? Horses running backwards, doors opening and shutting themselves or maybe making someone vanish altogether only to reappear later. Although we have no dotty witches at the Chaparral, strange things do happen from time to time and it’s always amusing when we spot these inconsistencies. One I love to see is what I call The Flintstones Run Around. Remember that stone aged family? Whenever one of the characters ran, the scene would be filmed in a barrel that spun round and round so Fred (or whoever) passed the same potted plant or row of houses twenty times before he got to wherever he was going. Most of the old cartoons did that. In the otherwise serious, A Time to Laugh, a Time to Cry episode, Mano has a brief Flintstone moment when he rushes through the same set of doors twice to reach Don Sebastian’s study. At least he didn’t do it twenty times, like poor old Fred does. I expect that they ended filming with that scene and picked up at the same spot the next day, forgetting that he’d already shot through the doors once. Though I’ve never seen a horse run backwards at any time, we do get a giggle wondering about the strange things that happen to horses. In To Stand for Something More for some reason, Pedro heads out in one direction riding Blue’s palomino Soapy, while Blue heads off in another direction riding Pedro’s horse. Yet when Blue returns to the Chaparral, he’s back on Soapy. I think maybe the mistake was made when they didn’t take their own horses in the first place. This isn’t the only incidence where horses change color so keep your eyes open next time you watch. We see another example of it in Only the Bad Come to Sonora when one of our three bandits rides a black horse for most of the episode. When they leave town to head for the desert, the horse has turned brown. But not to worry, he turns black again once they arrive in the desert. Maybe that particular horse carried the same heat sensitive Himalayan gene which causes the Siamese cats (and mice and rabbits) to be darker at cooler areas such as ear tips, and light at warmer areas. Yes I know, horses don’t get the gene doing that to them but wouldn’t it be fun if they could change color according to their body temperatures? Some of you might remember the horse of a different color in The Wizard of Oz. I can’t picture that rainbow specimen in the Old West, can you? If it was possible, Victoria’s horse would definitely be rose or lavender colored and of course Blue’s could only be blue! 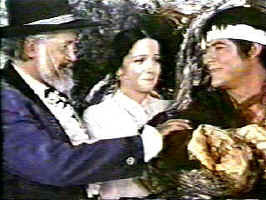 In that same episode we also see the three bandits turn into five for one scene but all is soon well again. The two mystery men disappear as quickly as they appeared. I like to think they were time travelers who ran into HC’s plane of existence for a moment then caught the slipstream back out of it. A similar moment of déjà vu also occurs in The Promised Land when the villagers who are going about their business in the opening scenes are in exactly the same positions at the end of the show. Like our old friends the recurring lightning bolt and hissing rattlesnake, we have another case of recycled footage there. 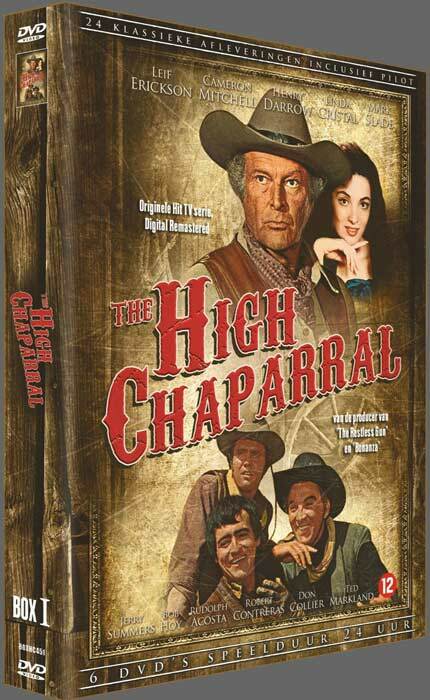 But then, wouldn’t that make High Chaparral ahead of its time? After all, aren’t we all told to recycle! In the episode, The Buffalo Soldiers, the men who played the soldiers were a group of individuals who re-enacted 19th Century Cavalry maneuvers as a way to preserve history. Some of them were also descendants of real the Buffalo Soldiers who were depicted in that episode of The High Chaparral.